My mom has perfected Lao fried spring rolls (cheun yaw) with the perfect flavor. Often people make spring rolls that are only good with dipping sauce. Her's are good even without it. Further, while spring rolls are typically eaten just with dipping sauce, we often had it accompanied and rolled up with lettuce, vegetables and rice vermicelli noodles (pun cheun yaw). Or optionally, use all those same items to make it all into one big salad (salat cheun yaw or cheun yaw lat sy salat). Soften fungus (mushrooms) and and clear vermicelli noodles in warm water and leave them while you prepare the other ingredients. Shred the carrots. Chop the onions. Lightly chop the warm vermicelli noodles. Bring all the ingredients listed together and mix thoroughly. Spritz fish sauce over the entire mixture. Perhaps 3-5 tablespoons. Mix again. Before you begin rolling all your spring rolls, take a bit of the meat and deep fry it or put it in the microwave to cook thoroughly. Taste it. Adjust the flavor of your mixture as needed. If you're happy with the taste, begin rolling them. Depending on how much filling you put, you could end up with a smaller amount of larger spring rolls or a larger amount of smaller ones. There's no rules so have fun with it and try making various sizes and perfect your rolling method. Deep fry them on medium-high. Remove them once they're golden brown all over and are floating to the top. Enjoy with your favorite spring roll dipping sauce. Let us know if you try the recipe. Eat up and enjoy! Trying these out tonight. The look so good!! Not sure i bought the right wrappers though. Do you use the dry wrapper? Dip in water then wrap then fry?? Glad to hear you're interested in the recipe. 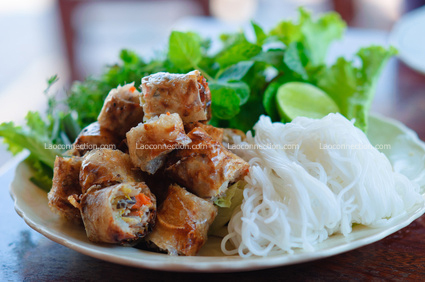 We use the pre-made spring roll pastry. It does not require dipping in water first. You would use it straight out of the package. The method you mention is doable too but with rice paper wraps (and not the pre-made spring roll pastry). An example of the pastry we used would be Spring Home TYJ Spring Roll Pastry made in Singapore from wheat flour (available in any Chinatown grocery store). It sounds like you may have bought the dry rice paper wraps/sheets though. Some people do use those but it's not as common for deep frying and it's more cumbersome to work with and to deep fry.